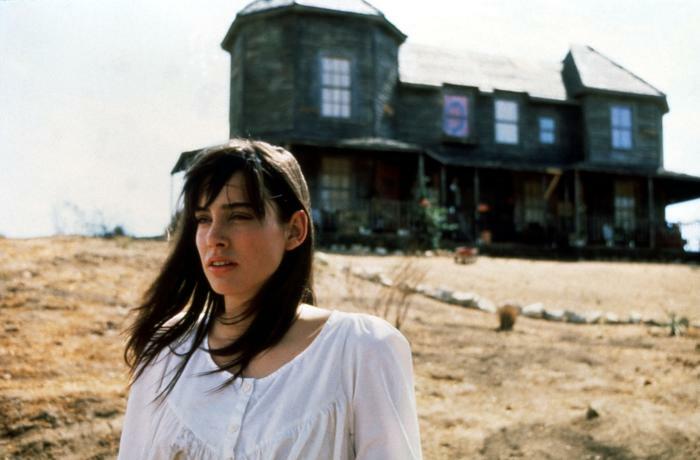 Digi-Schlock: BAD DREAMS/VISITING HOURS (Scream Factory Blu-Ray) – Schlockmania! 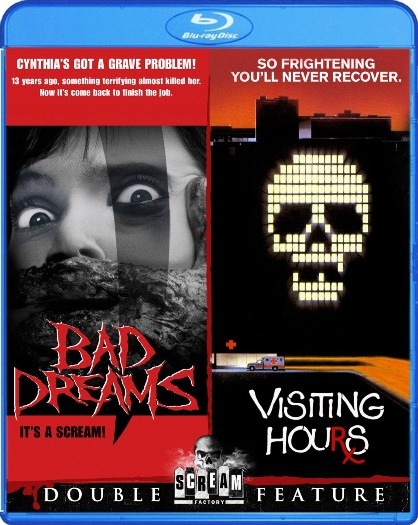 In 2011, Scream Factory did a 2-DVD reissue of Bad Dreams and Visiting Hours. It was a nice way for fans who missed out on the old Anchor Bay DVD’s of these films to catch up with them and it even threw in a few new extras for Bad Dreams. Scream Factory has recently revisited this set for blu-ray, fitting both films and all the extras on one blu-ray… and adding a nice amount of new extras for additional value. The results are worth the upgrade, particularly if you’re a fan of the underrated Visiting Hours. Both films benefit from the high-def treatment they receive here: colors are strong on both titles, detail gets a noticeable boost and the elements for both were in good shape (presumably, these are the same transfers as the Scream Factory DVD set but presented in lossless form here). Bad Dreams gets both 5.1 and 2.0 stereo mixes while Visiting Hours sticks with the original 2.0 stereo mix, with all options presented in a lossless form. Bad Dreams ports over a variety of extras from the previous Anchor Bay edition. The most notable of these is a commentary track with director/co-writer Andrew Fleming. He’s moved on to a more mainstream career since then, including the excellent Hamlet 2, but he remains fond of his work here. He offers a chatty, often self-deprecating stream of comments about the film that covers the script, the shoot and the cast & crew. He is not afraid to point out things he would change today and tells some interesting stories about how James Cameron (then-husband of his producer) was a frequent visitor to the set. There’s even an unexpectedly complex tale about how “Sweet Child O’ Mine” by Guns ‘N Roses ended up as the film’s end credits song. The other Anchor Bay-era extras include brief EPK-style videos designed to promote the film, including a look at the makeup effects by Michele Burke and a brief chat with producer Gale Anne Hurd. There is also a trailer and a still gallery. However, the most interesting extra from the original batch is an alternate ending to the film. It’s presented from a workprint video source and offers a coda that is more interesting and gruesome than what ended up in the film. 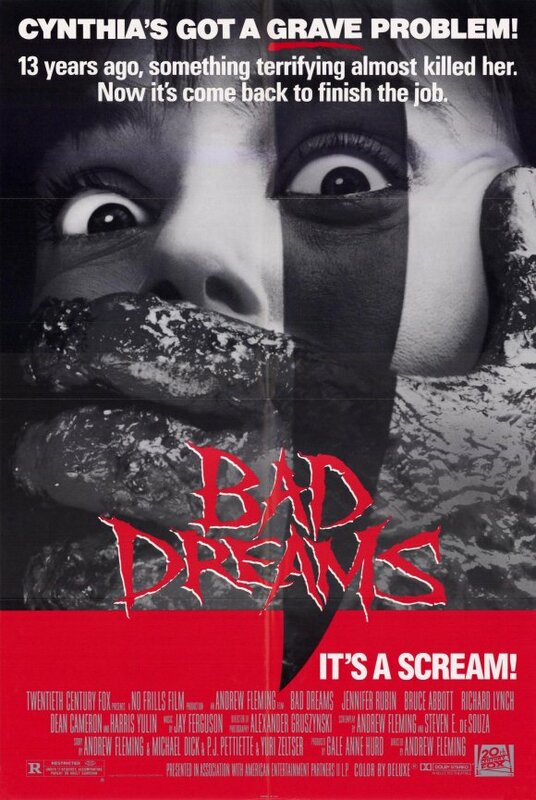 The blu-ray also includes the featurette that debuted on the Scream Factory DVD for Bad Dreams, “Dream Cast.” It was produced and edited by Michael Felsher and features interviews with cast members Bruce Abbott, Jennifer Rubin, Dean Cameron and Richard Lynch. All four participants are forthcoming about their memories of the shoot: Abbott is very charitable to all involved but chuckles at the disbelief-straining nature of the finale, Rubin and Cameron offer their differing perspectives on why they didn’t get along during the shoot and Lynch proposes a surprisingly serious interpretation of the film. Their comments are briskly edited by Felsher, who keeps the pace snappy with a nice collection of clips from the film. The result is informative and well worth a look. Visiting Hours carries over the bonus features included on the past disc. Those consist of a set of trailers and a still gallery. The trailers are fun to watch because they incorporate a creepy bit of animation that references the film’s distinctive poster design. The gallery offers a set of color stills and two versions of the film’s poster. There is also a brief radio spot for the film, built around the amusing gimmick of recording an audience screaming while watching the film. The big draw for this disc in terms of extras is a trio of new interview featurettes for Visiting Hours produced by Aine Leicht. It starts in a memorable way via an interview with screenwriter Brian Taggert that runs a whopping 44 minutes. The first twenty minutes of the piece is devoted to Visiting Hours, with Taggert discussing how he transitioned from comedic playwright to horror screenwriter. He talks about how he was commissioned to write a script that shocked or disgusted the audience “every seven minutes” and working closely with producer Pierre David and director Jean-Claude Lord on the shoot. He also reveals that he wrote the lead role for Lee Grant and that she influenced the feminist theme that informs her characterization. The remainder of the featurette is devoted to Taggert’s subsequent career as a genre journeyman, starting with how he was brought in to do a last-minute rewrite for V: The Final Battle after successfully pitching it as a sci-fi soap opera (!). He goes on to discuss the many horror sequels he has penned, including Poltergeist III and Omen IV, as well as The New Kids, The Spell and many more. It’s nice that Leicht took advantage of the opportunity to hear from a lesser-known genre figure and horror fans will appreciate the result. The next piece is a short but info-packed interview with producer David. He talks about Visiting Hours as a “producer” film, describing how he came up with the concept and hired Lord and Taggert to execute his vision. He also talks about the mix of hospital sets and real hospital locations used in the film and offers a fascinating account of tracking down the head of Fox to sell the film, including a description of the deal he made. It’s a fascinating glimpse into horror cinema from the business side and David is a fun, witty raconteur. The last interview features Lenore Zann, a regular in Canadian horror films of the early ’80s who has plenty of interesting things to say. She offers a unique psychological take on her character and her character’s relationship with the villain, gives a feminist interpretation of the plot and reveals how she did her big attack scene with a broken wrist. She also talks about her subsequent career moves, which include cartoon voiceovers, writing a play and even working in the Canadian government. Like the other new interviews, it offers more than you might expect. In short, this double feature disc is a good example of what Scream Factory does with catalog genre fare: they took two titles that fans would be lucky to get bare-bones disc versions of from a major studio, presents them nicely and kits them out with all the extras the disc can hold. If you’re into either of these films, this is the way to go on home video. 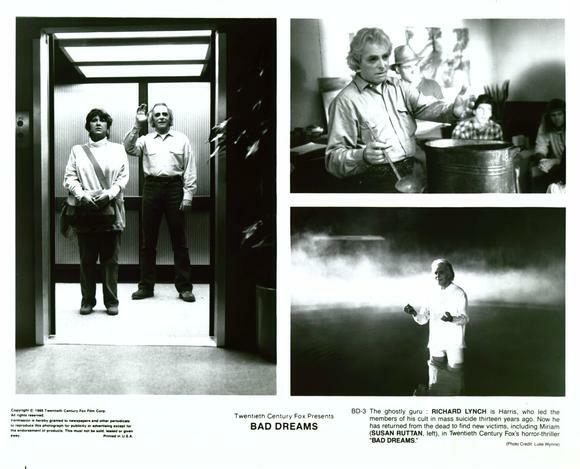 To read Schlockmania’s film review of Bad Dreams, click here. 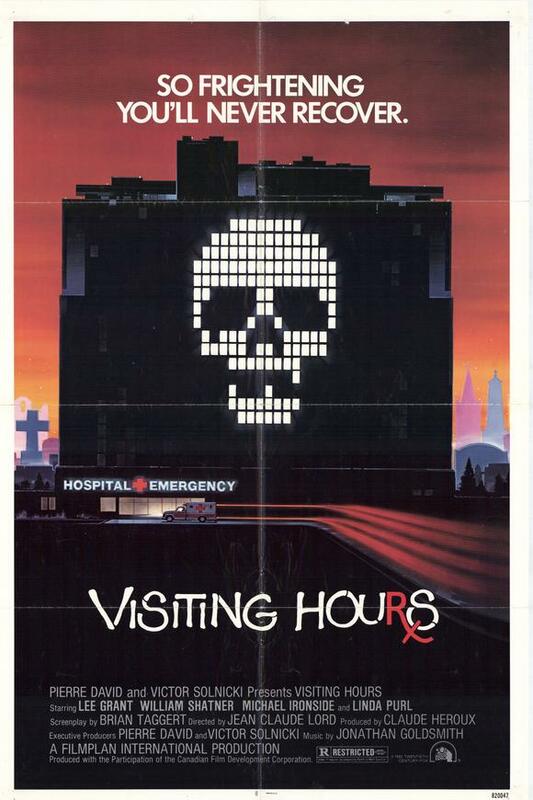 To read Schlockmania’s film review of Visiting Hours, click here.